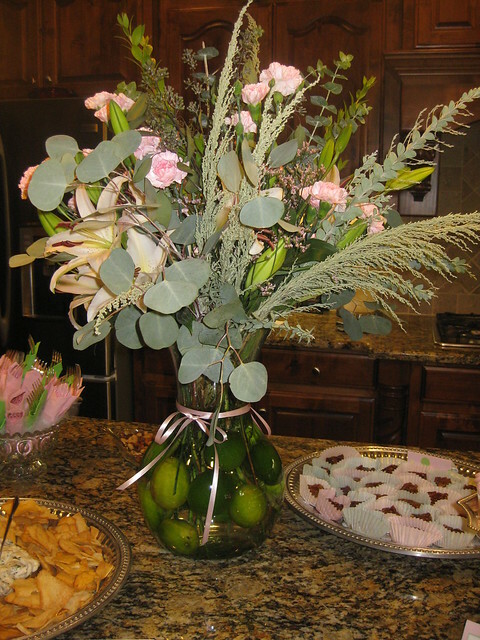 This weekend has been a whirlwind filled with friends, football and borderline hot weather. 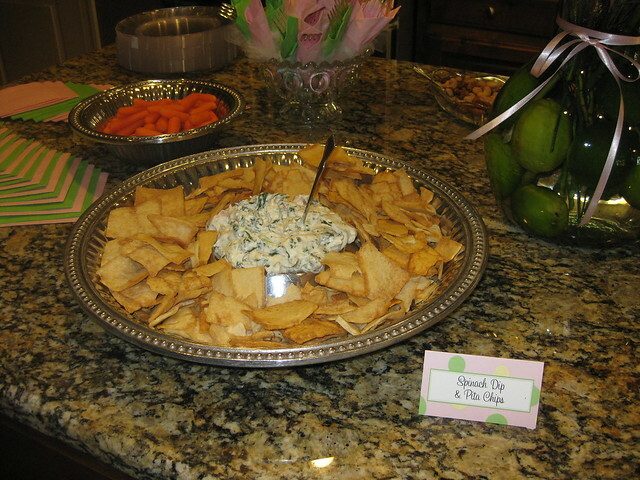 Friday I left for an overnight trip to Little Rock to help throw a shower for a dear friend. Earlier on Friday I had mentioned to Drew that the Civic was acting weird when it started up. He checked it when he got home and said everything looked fine, so I packed up and got on the road in hopes to miss rush hour traffic. Problem is, when I got in my car after a quick stop at the gas station, the Civic wouldn't start. LOVELY. Thankfully I was still in town, so I called Drew, and he had to come to the gas station, jump the Civic, and then we headed home to switch cars out AGAIN. I left about an hour and a half later than planned, hit rush hour traffic, and made it to Little Rock at 9:00 instead of 7:30. Oh well. 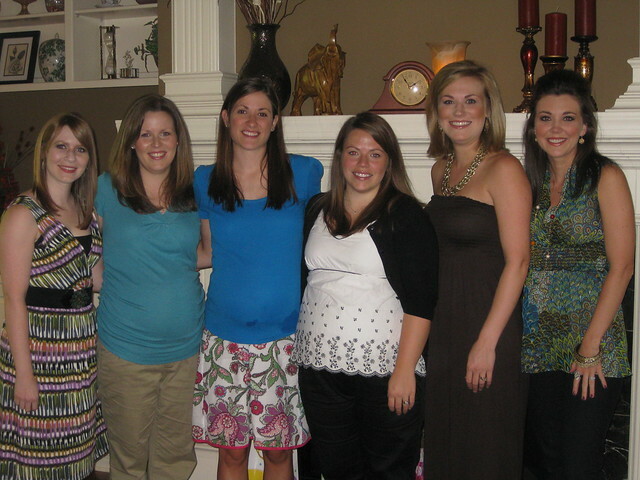 (from L to R): Christy (the lone non-preggers), Steph (due with baby boy #3, and due one week before me! ), Me (do you love how I have water underneath my baby bump?? 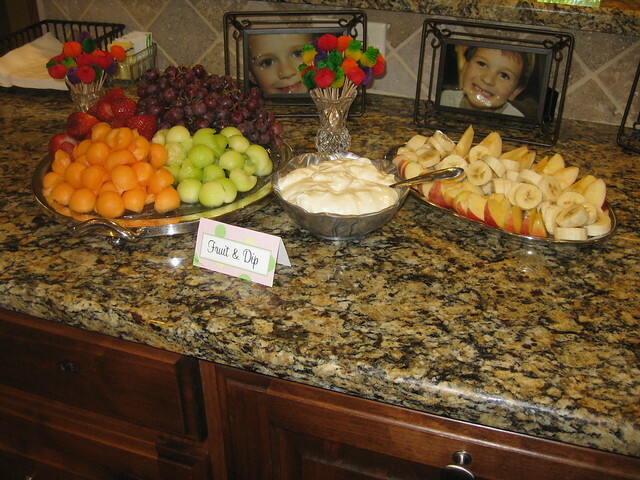 I had just finished cutting the fruit and was leaning against the counter... LOL! 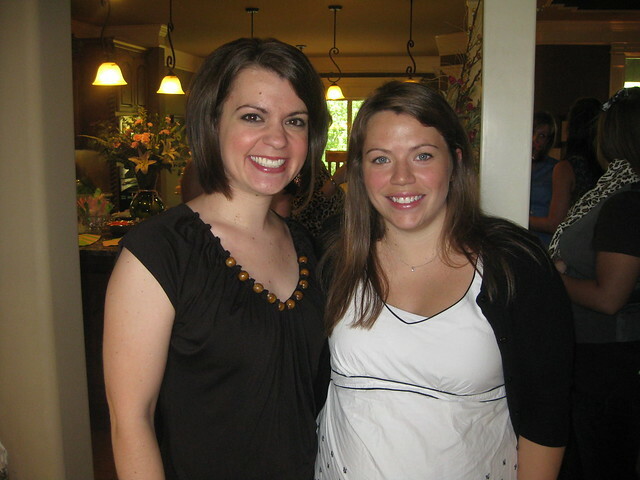 ), Katie (the one we were showering and the lone girl mommy of the group-- all the rest of us have boys! 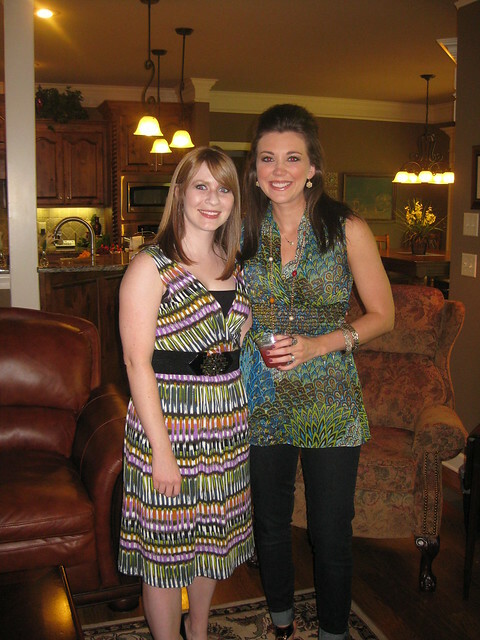 She's due the beginning of November), Courtney (she is 22 weeks pregnant with baby boy #3... I know, makes me sick too!) and Amanda-- she's 12 weeks pregnant. I love these girls SO much! 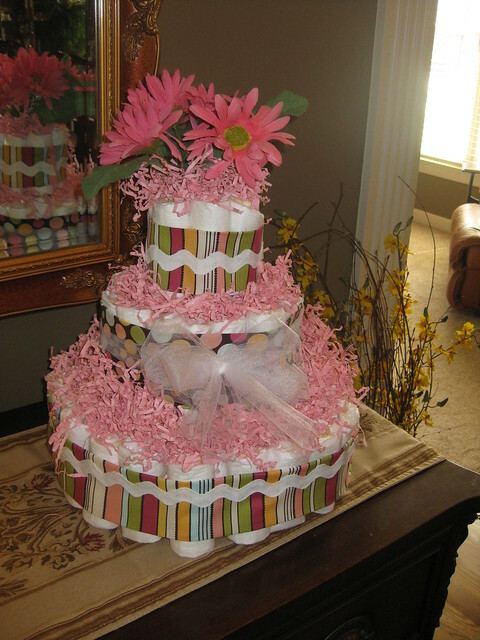 The diaper cake-- didn't Courtney do such a great job?!?! 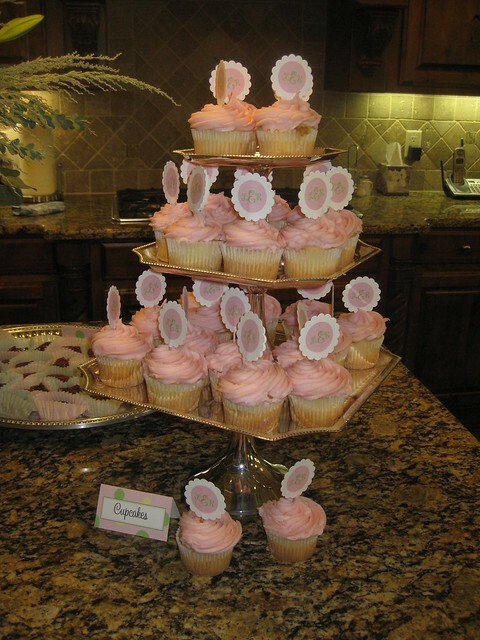 Do you see the cute toothpicks? I loved them! 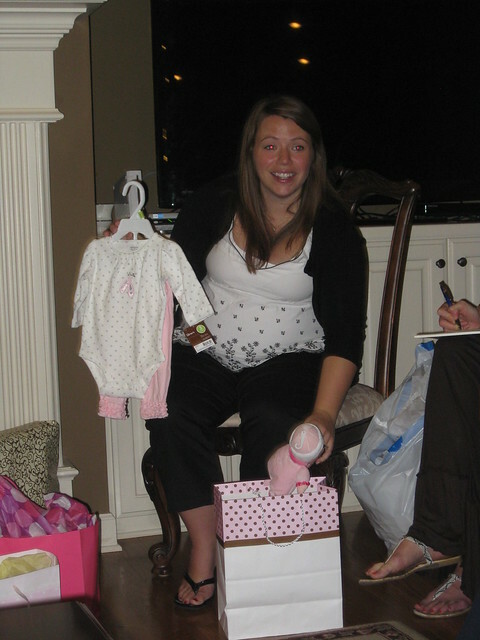 Katie got some great gifts and super cute outfits for baby Liberty! These jeans were PRECIOUS... they had tab pockets on the back, which I am a sucker for! 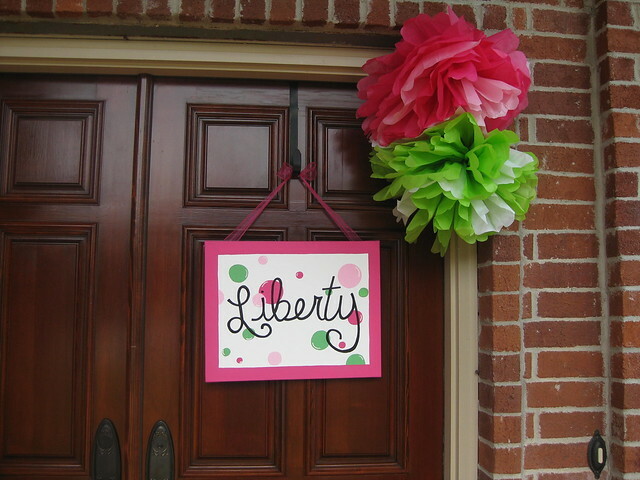 Courtney made this canvas to hang on the door (and for Katie to use in baby Liberty's nursery), and she also made the cute pom-poms out of tissue paper! After the shower I headed back home, and enjoyed the peaceful drive listening to the Razorbacks on the radio. The drive was peaceful... until I stopped for a soda and upon getting back onto the interstate, spilled the ENTIRE 44 oz Dr Pepper in our CRV. It was a catastrophe. So I pulled over at the next stop in hopes that I'd be able to figure out some way to get all of the soda out of the carpet. There was only some cheap paper towels there at the gas station, so I managed to do the best I could with those, removed the rug from the car, and proceeded on my way. I was SO ticked. I am crossing my fingers that it doesn't stain the carpets too bad (Drew helped me mop up most of it when I got home, but it had been sitting in the car at that point for over an hour, so it's yet to be determined the real damage that was done). Today we've had church, and a little get together with our community group this evening. I am a bit overwhelmed with everything I still need to catch up on this week, especially in light of the fact that Drew and I decided to move the date of our garage sale to next weekend. LOTS to do, not much time to get it all done. Story of my life, right? Hope everyone has a great week!